Located between San Antonio and Austin, with Houston to the East, The Luxe at Creekside in New Braunfels places residents in at the center of cultural excitement, high-end shopping, and natural beauty. Dive into the rich colonial heritage of San Antonio with a historic stroll along the Riverwalk pedestrian promenade weaving through the World Heritage Site Spanish colonial missions and the infamous Alamo. Explore the diverse culture and eclectic live-music scene in Austin. Rejuvenate and explore Austin's beautiful natural offerings with the majestic hiking, biking, and boating opportunities. New Braunfels is known for the Comal and Guadalupe rivers and the 65-acre Schlitterbahn Waterpark and Resort. Consider the once-in-a-lifetime chance to live in a luxurious apartment home near high-end restaurants and cafÃ©s while admiring the meticulously-preserved 1800s German architecture in the Gruene Historic District. 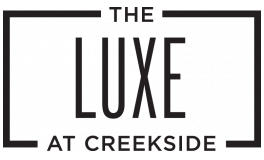 With easy access to I-35 and I-10, Luxe at Creekside is the perfect home for your lifestyle. Contact us today for a tour!